The Elan uses the 128000-4571 Nippon Denso Starter motor. Correct replacements are difficult to find and are expensive. Especially if you live outside of the UK or US. Carl Dawes. at repairkitsuk has over 25 years experience in repairing Starter motors and has come up with a simple inexpensive repair kit for our starter. 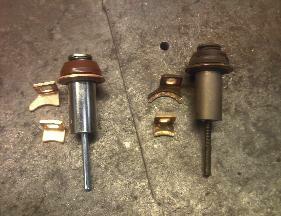 He noticed the only part of the starter which was faulty and worn were normally just the contacts and plunger assembly. brush gear and armature wear was normally found to be negligible. Carl has a lot of very satisfied customers and is willing to ship parts worldwide. The kit works if there is only a single click on turning the ignition key, if the problem is a rapid (machine gun) type click then this is either a flat battery or a broken wire internally. The only other (very rare) issue with these starter is a slipping internal clutch, this can be diagnosed by listening to the starter whilst it is operating, the symptom would be a mechanical grating or high pitched squealing noise and no drive coming from the starter so basically the starter is spinning and the drive gear is meshed with the flywheel but because the clutch is slipping no drive is available. The Clutch system can also be replaced.